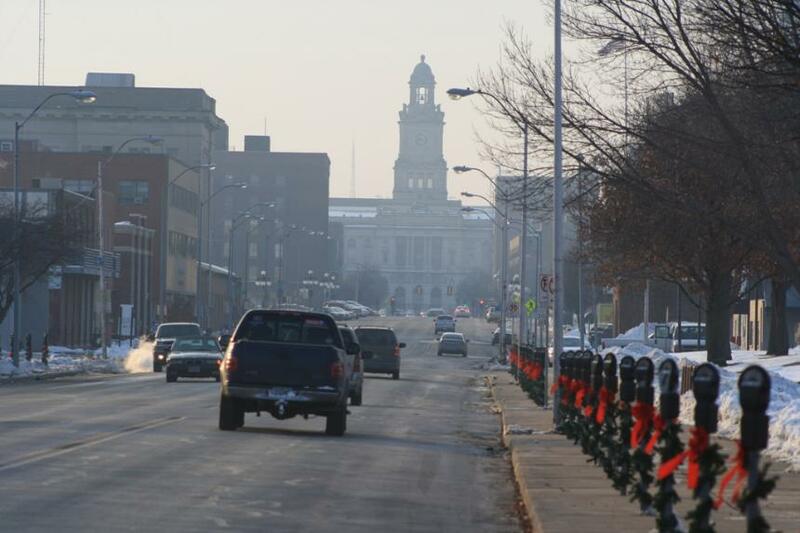 Looking west along East Court Avenue in Des Moines, Iowa, at the Polk County Courthouse. The photograph was taken on a warm December day when a temperature inversion in the atmosphere trapped fine particulate matter close to the ground. The result was the haze that is visible in the photo. In response to elevated fine particulate pollution, the Polk County Air Quality Division, which operates under the auspices of the Iowa DNR's Air Quality Bureau, issued a public warning about possible health hazards. Air quality policy in Iowa and other Midwestern states is driven primarily by regulatory decisions of the US Environmental Protection Agency (EPA). The EPA derives its authority ultimately from the Interstate Commerce clause of the US Constitution, because many pollutants travel or have the potential to transport across state lines. Pollution from one state should not be allowed to interfere with industry in another state, or across regions. More specifically, federal regulation falls under the Clean Air Act and subsequent Congressional actions, such as the Superfund bill and toxic substances law. Federal law recognizes two major groups of air pollutants: the six "criteria" pollutants that can move the greatest distances and/or cause the greatest harm to human health and environment; and the Hazardous Air Pollutants, which are many and which cause more localized but serious threats to health and environment. Leeward's owner, Leland Searles, directed the Air Quality Policy program of the Iowa Environmental Council from 2009 to 2011. He acquired an understanding of the scientific methods and results used by federal and state agencies to measure air pollution and set standards. He reviewed the construction and operating permits issued by the Iowa Department of Natural Resources, Air Quality Bureau, that limit emissions of pollutants by industry throughout Iowa. Searles spent time developing the Council's data files not only on regulations and policy efforts but also on key Iowa communities that experience acute and chronic air pollution. He encouraged local actions to understand and address public health threats. For more information about the Iowa Environmental Council and its efforts, please visit this web site or this Facebook page. To explore the Iowa DNR Air Quality Bureau's functions, visit this web page. particulate matter, divided into coarse (dust), fine (haze), and ultrafine sizes, each with different health hazards because of how the human body interacts with and responds to them. lead, once an abundant pollutant from gasoline, and now emitted mainly from the combustion of coal for energy production. several oxides of nitrogen that come from all kinds of combustion of fuels (coal, Diesel fuel, gasoline, natural gas, and more). Their main health effects come from their entry into the body by way of the lungs. carbon monoxide, again from combustion of petroleum products like gasoline, natural gas, and other fossil fuels and biofuels. It is the "odorless killer," and newer homes now must have carbon monoxide detectors as well as standard smoke detectors. ozone, a by-product of combustion and faulty electrical equipment. It is a necessary component of the upper atmosphere, where it acts as a shield against harmful cosmic radiation. You may know about the "ozone hole" centered over Australia, the result of worldwide use of certain aerosols in spray paint, hair spray, and other pressurized products. These aerosols were banned, and the ozone hole is shrinking, a major success for scientific study and governmental regulation in response to an environmental problem. sulfur dioxide, another pollutant from fossil fuels such as coal and petroleum. With the disappearance of high-grade anthracite coal several decades, lesser grades of coal are now used that have varying amounts of sulfur. Some coal beds have low sulfur content, such as the Powder River Basin coals that are shipped throughout North America. But some coal-burning facilities also use cheaper high-sulfur coals when possible. Sulfur dioxide changes to sulfuric acid in the atmosphere and in human lungs, causing damage to ecosystems ("acid rain") and the oxygen uptake ability of the lungs. See the EPA web page, "Six Common Air Pollutants," for more detail. The "HAPs" or "air toxics" are too many to list, but they include arsenic, asbestos, benzene, chromium, dioxin, mercury, toluene, and 180 other substances. The health effects often are specific to one organ or one physiological system. For example, mercury's primary threat is to the brain, especially to the brains of young children and fetuses. The energy industry is a main contributor of dangerous pollution, and it also is heavily regulated to require filters and scrubbers to remove most of the pollution. However, there are occasions on which a coal-fired energy plant puts out too much pollution, causing an "exceedance" of the health-based EPA limits for one or more pollutants. In the most vulnerable areas, the EPA or a state regulatory agency installs measurement equipment to monitor levels of pollution. Areas of eastern North America are still recovering from "acid rain," because of the use of sulfur-containing coal; coal combustion leads to the formation of sulfuric acid in the atmosphere. Another major producer of "mobile-source" pollution is the internal combustion engine, which powers the majority of vehicles on the road. (Diesel engines also contribute a significant amount.) Pollution from cars and trucks is regulated to reduce the dangers to health and environment. With the removal of leaded gasoline from service stations and the conversion to unleaded fuels, a major threat from lead was cut to zero, although other sources remain. What's more, automobile pollution contains other substances, such as the nitrogen oxides. Coal combustion, Diesel and gas engines, and other sources of the "big six" criteria pollutants also contribute HAPs. Other industries add a narrower range of air toxics, depending on what type of industry is involved. For example, swimming pool services add chlorine gas (yes, the same gas that was used to great effect on the battlefields of World War I). Metal polishing may put out chromium. Spills of gasoline at service stations add benzene and other petroleum compounds to the air.